Died: March 29, 1955 in Pocasset Ma. at 81 yrs, 3 mos, 6 d.
Married: November 20, 1914 in Boston Ma. 1. 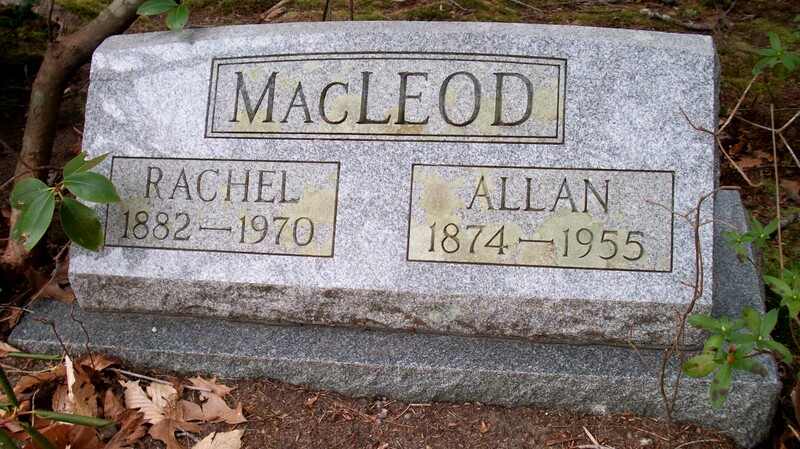 Roderick Allan MacLeod, WW ll; (June 11, 1916 – September 26, 1971); Married Ida May Poucher (1918 – 1993) (Clarence Henry Poucher & Ella May Lake) in Seabrook N.H. on September 26, 1938; Roderick & Ida are buried in Cataumet Cemetery; Their daughter, Mary Elizabeth MacLeod Ziemba (1939 – 1981), is also buried in Cataumet Cemetery. 2. Darrah Elizabeth MacLeod Fuller; (April 22, 1927 – February 14, 2012); Married Donald Grinnell Fuller (1927 – 2006) (Maurice Leonard Fuller, WW l & Lillian Grinnell) in Cataumet Ma. on November 6, 1948; Darrah & Donald are buried in Cataumet Cemetery.